We all understand that the real purpose of a white elephant gift exchange is to gather friends together and have fun sharing unique white elephant gifts and great conversation. We also know that these group activities are more memorable when the host suggests something different. 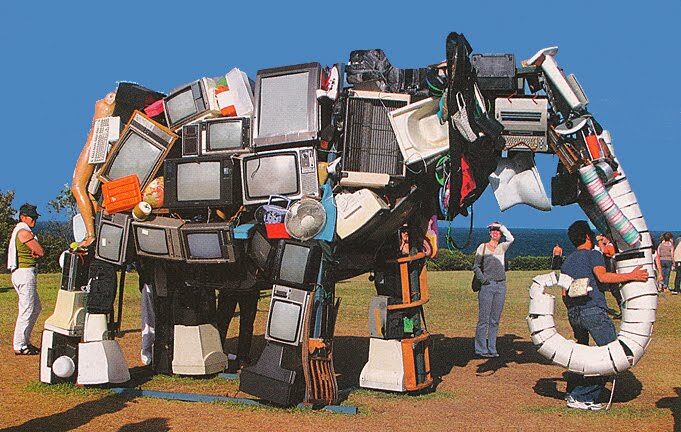 We suggest that you do something unique this year and host a Junk and the Trunk white elephant party? The rules are simple – Only gifts from a salvage or junk yard will be allowed. Given that this weekend will mark another Earth Day, why not share recycled stuff with family and friends in a white elephant gift giving event. Because gift shopping in a junkyard is a little bit different than going to WalMart, we have asked an expert in junk to share some insights. Joey’s Junk has provided us some information on how to find the perfect white elephant gift for your Junk and the Trunk gift exchange. If you are someone who sees the junk removal of others as a fascinating opportunity for your own home, you are in luck. As distressed goods and second hand furniture becomes more attractive, there are a lot of people who are interested in salvage yards and junk yards for their furnishing and hobby needs. While salvage yards have long been a place where people could find parts for car restoration, you’ll find that there are plenty of things that you can discover for your home and your hobbies. Check out these tips to get you started. Call the Junkyard’s Owners Before Doing Anything Else. City junkyards are typically not open to the public, and private junkyards are of course private property. Before you show up, make sure that you call ahead and let them know what you are after. This is essential if you want to avoid a hefty fee for trespassing! Junkyards are full of, well, junk, and some of it is rather dangerous. Wear sturdy shoes, and long-sleeved shirts as well as jeans or some other sturdy covering on your lower half. If you are going to be doing some digging, be sure that you bring along some thick workman’s gloves to protect your skin. A tetanus shot is also a very good idea. You never know when someone else’s junk removal is going to throw you a treasure. You can start by having a vague idea of what you need, but if you keep an open mind about things, you can discover some great options out there. You never know when you are going to discover something that you absolutely did not know that you needed. With the threat of bedbugs and other insect hitchhikers, it is always worth thinking about how you can disinfect things. Most household goods are fine with some bleach, but be especially careful about wooden furniture. Some people choose to follow the rule that if it can’t get tossed into the dryer and sanitized, it can’t come in the home. You never know when you are going to find something that needs two people to carry it. A friend can also serve as an extra pair of eyes if you are looking for something specific, and you will also find that having another person there can just be fun. Some junkyards will let you haul things off for free, while others do ask that you pay for what you find. A certain amount of haggling is expected, and if you have never haggled before, it can be a little harrowing. Many junkyards will give you everything you find for a lump sum, so before you approach the area, have an idea of what your finds all together are worth. This avoids being put on the spot when the owner asks you what you want to pay. A junkyard has some fantastic options open to you, so be ready to get to work as soon as you find one! Thank for your great post.